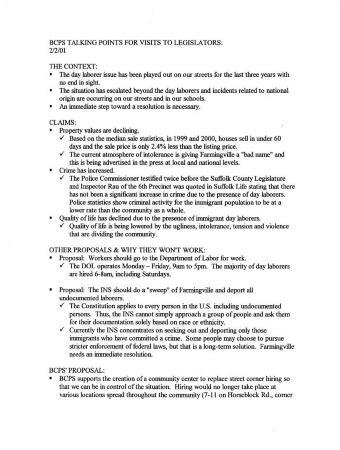 Brookhaven Citizens for Peaceful Solutions (BCPS) talking points for visits to legislators regarding issues involving the Farmingville community's day laborer situation, Suffolk County, N.Y., February 2, 2001. Source: Hofstra University. Hispanic/Latino Collection, 1951-2008. Box 12, Folder 8.